Breaking the fast—I’m a fan. 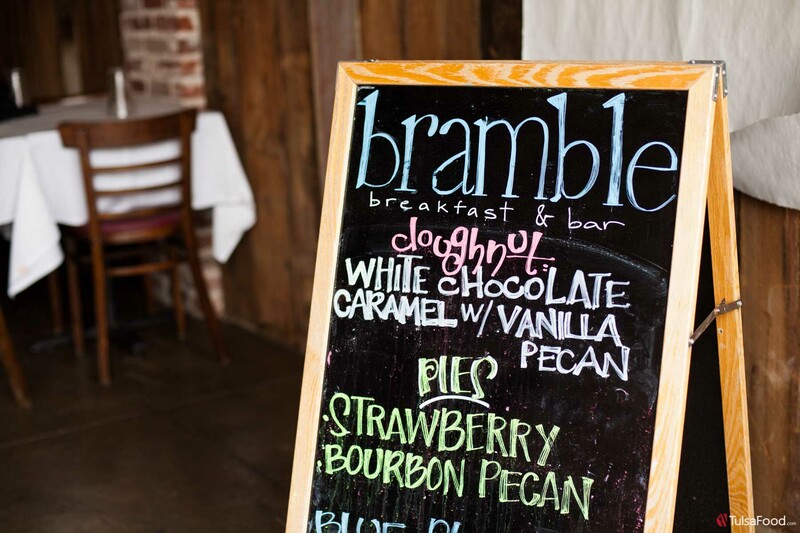 Breaking it at The Bramble in Downtown Tulsa is like a little slice of Heaven. Well, wait. That was the dessert of lemon blueberry pie. We’ll get to that. This new concept is brought to us by the same sweetheart mastermind, Chef Michelle Donaldson, who gifted Tulsa is with Tallgrass Prairie Table (next door) just a couple years ago. 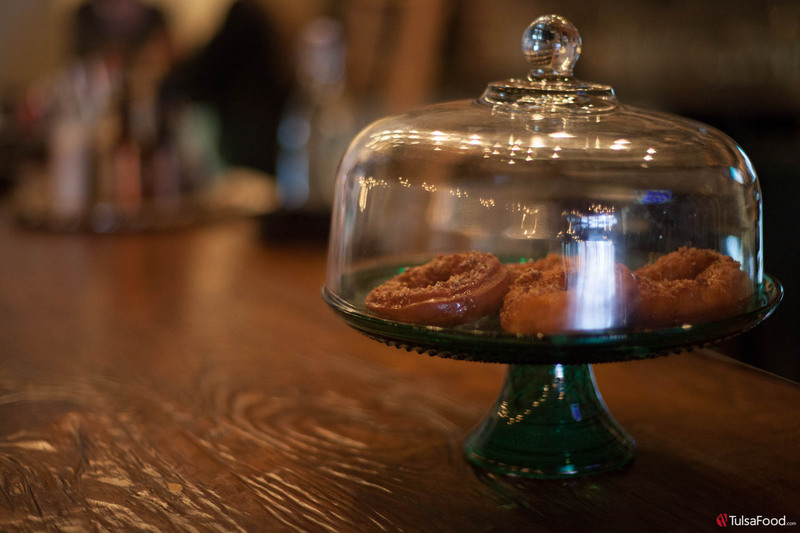 First, we start with a homemade doughnut….like the kind you attempted to make in Home Ec in 8th grade, but more poised a million times over. They sell out FAST. “Someone just came in and bought every doughnut we had this morning,” says our kind server. The Daily Doughnut on this day is maple, brown sugar and bacon— yes, all together. As one friend put it, they’re redonc. 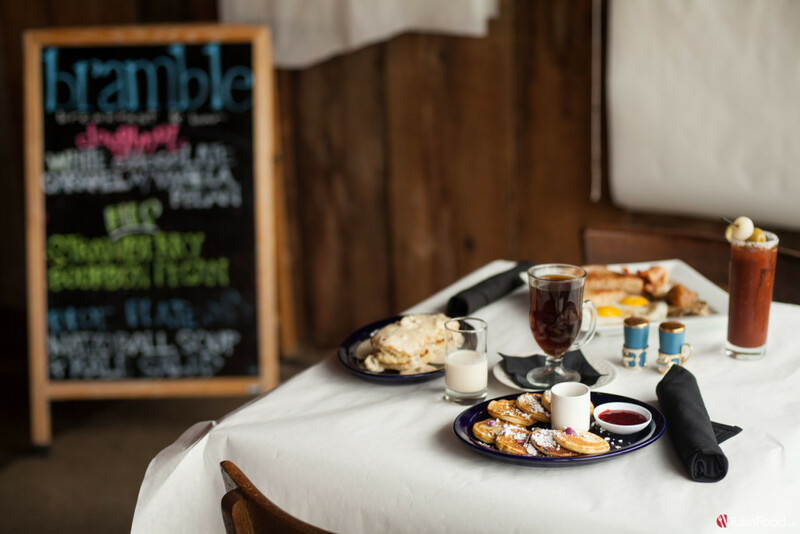 The menu offers anything you might want in a traditional breakfast with some spins here and there. Sipping on a mimosa is only appropriate as you scan the options. Yes, it comes in a mason jar. You get the farm feel of wide open spaces, yet the overhead sparkle of crystals reminds you that you’re in the most up-and-coming part of the city. 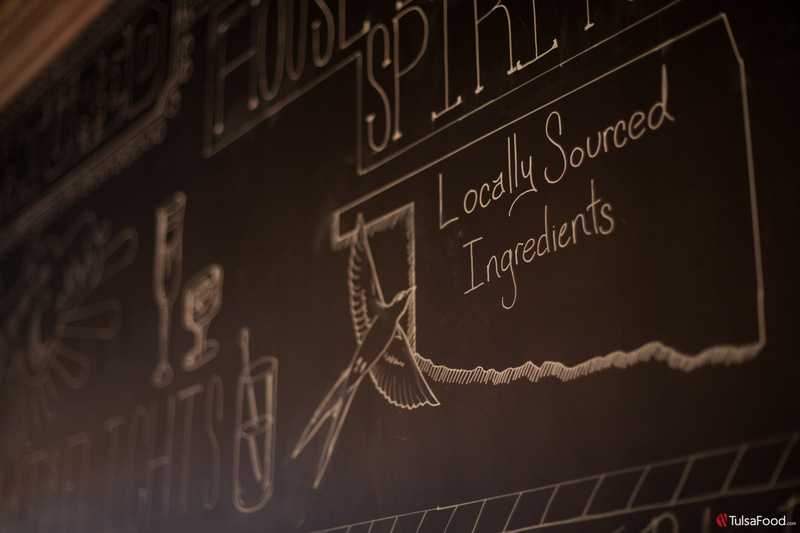 Feel free to ask questions such as “what is duck confit?” The staff is more than willing to make suggestions and answer about the farm-to-table concept. Everything is fresh. Everything is homemade down to the ketchup. 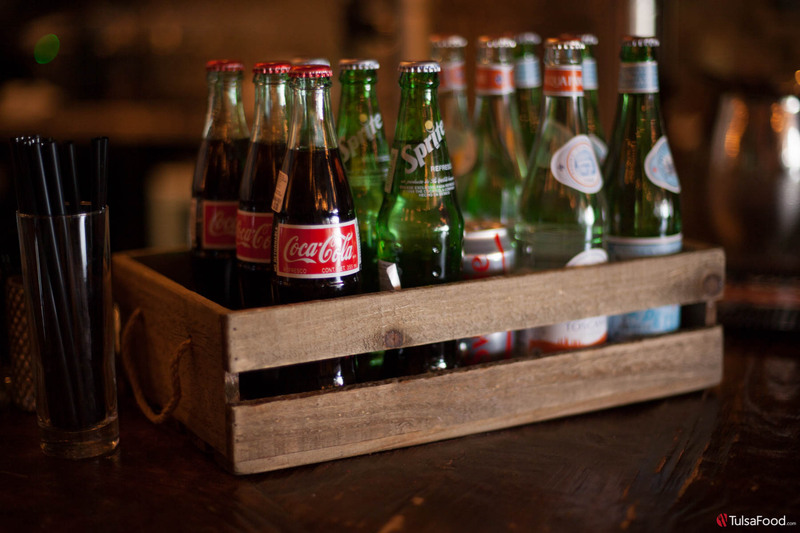 You won’t find HFCS (High Fructose Corn Syrup) here. 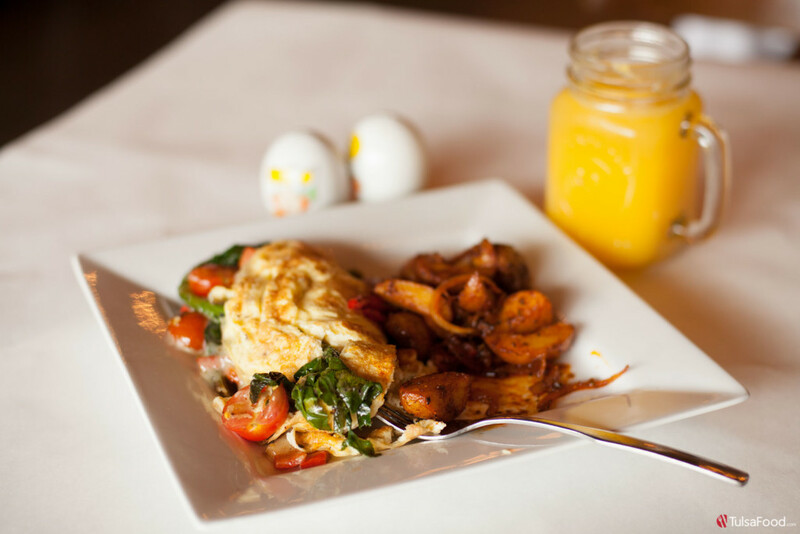 If you are looking for a vegetarian option you really can’t go wrong with a veggie omelet with onion, pepper and tomato, duck fat home fries and LOMAH Dairy cottage cheese. If you order the BKT (Bacon, Kale salad, Tomato) sandwich that comes with thick-cut bacon, expect thick-cut bacon. This monster of a brunch item satisfies with the lemon anchovy vinaigrette kale salad, manchego (sheep cheese) and crispy chicken skin. 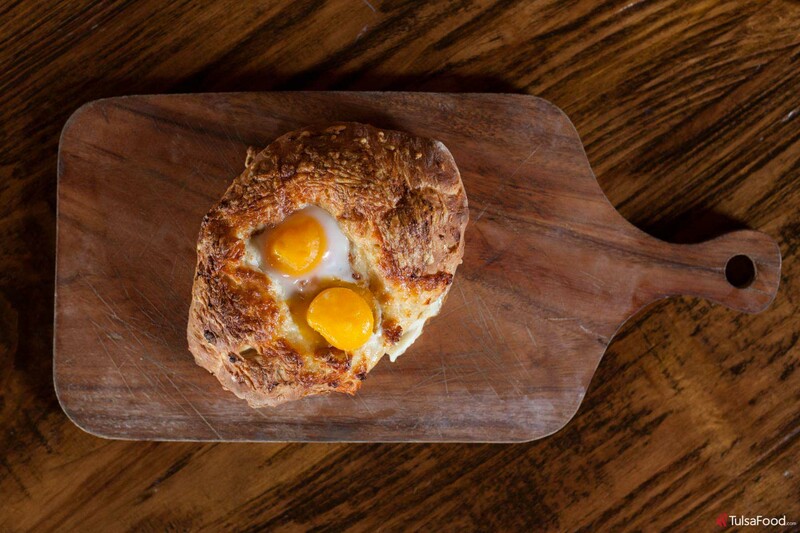 The Khachapuri, The Bramble’s most popular item, is a cheese-filled pull apart bread embedded with a fried egg that is certain to keep T-Towners and out-of-towners talking. It is meant to be eaten by tearing pieces of bread and dipping it in the egg-cheesy goodness. Let this be the first thing your table orders when you first sit down. Don’t skip dessert. You’ll be cheating yourself out of life experience if you don’t deviate from your diet. So just do it. On this day we have a choice of apple with cheddar crumble, lemon blueberry and coconut, amongst others. The lemon custard with organic blueberries and perfect piecrust takes me to a place of sunshine. I slowly savor the tart and sweet with the perfect texture of flaky, simple crust. Whipped vanilla cream tops it off. Just park far away and walk. Speaking of cream, if you’re in the mood for a different kind of sweet, the full bar offers a Jack “N” Coke Float made with whiskey ice cream and cola. That or a Porter Cinnamon Float should suffice. Jennah Jane is a graduate of Oklahoma State University with a degree in Broadcast Journalism. 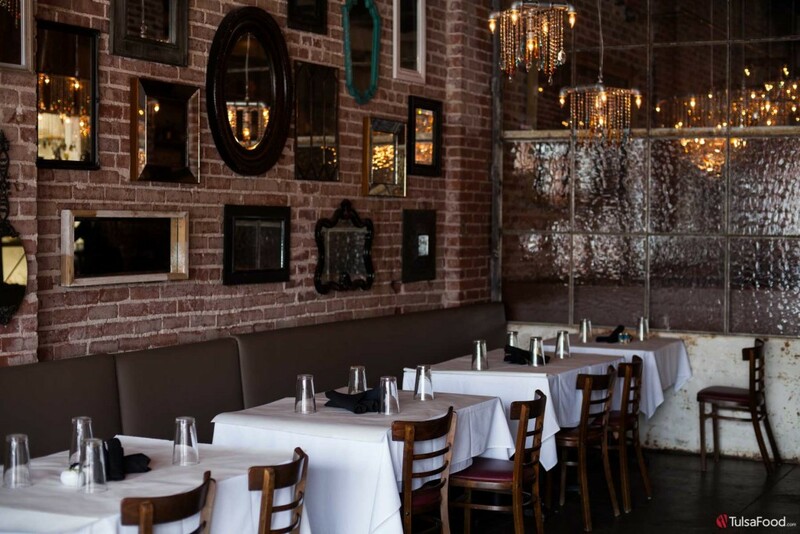 The Oklahoma-born, self-proclaimed food lover grew up in Fort Smith, Ark. but is proud to call Tulsa her home. Jennah has traveled to a number of countries and tried foods in Mexico, Canada, Austria, Croatia, Japan and Hungary, where she lived for a time. She grew up on Mom's home cooking which included Great Grandmother Florence's recipes along with tweaking of traditional southern dishes. "Eating is an adventure! It is life! It is a basic need, and meeting that need is loving others. I love to be able to share my journey!" she said. 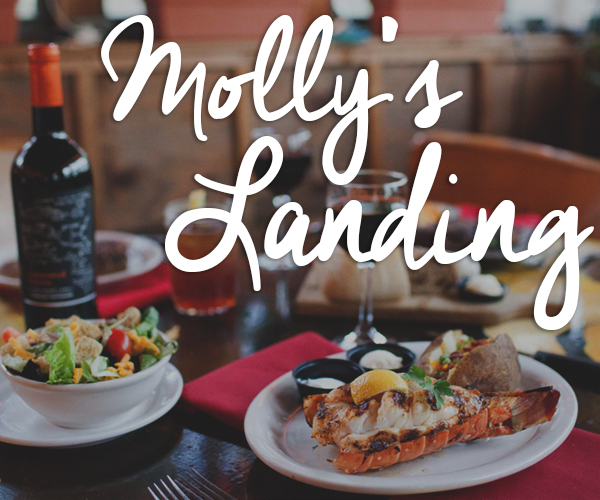 When she isn't enthralled by a plate of food, she enjoys traveling, reading, exercising, antiquing, shopping the Farmers' Market, live music and raising two boys in downtown Tulsa. Jennah also has the blog www.jennahreallyspeaking.blogspot.com.